Diogenes is the ideal application for those people that really like ancient languages. 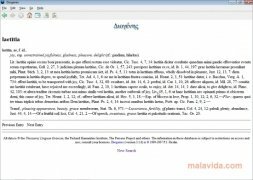 It's a tool to browse and search through databases of ancient texts, especially in Latin and Greek. By default it includes eight different databases, even though it also offers us the possibility to import other databases we're interested in. Among those that are used by Diogenes we have to highlight some like Perseus or TLG (Thesaurus Linguae Graecae). 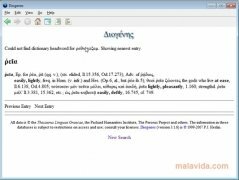 With Diogenes we'll be able to receive help about the morphology of a word, its translation, check in dictionaries and we'll also be able to check passages in ancient texts. We'll simply have to choose which type of search we're going to perform (a word in the dictionary, a morphology check), choose the database and input the search. With these steps, the program will offer us all the information that it finds regarding the latter. This tool can come in very handy if you are studying Latin or Greek, as it will help you to understand sentences and words in these ancient languages.